Legg Mason Cap Management Opportunity Fund aim is to provide long term capital growth. It utilizes its assets to purchase securities, derivatives and other financial instruments that offer growth opportunity. The fund manager is Bill Miller and Samantha McLemore. It has no yield and 5.75% sales load. The expense ratio is 1.34%. The portfolio turnover rate is 33%. 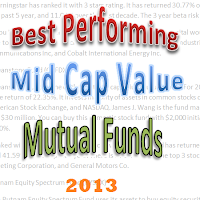 This best performing mid cap value mutual fund has YTD return of 37.53%. As of December 2012, the top 5 stocks in its holdings are PulteGroup Inc, Pangaea One Lp, Apple Inc, Ellington Financial LLC, and KB Home. It ranks with 1 star and neutral rating. The Hotchkis and Wiley Mid-Cap Value Fund utilizes its assets to purchase common stocks of mid capitalization U.S. companies. It is introduced to investors on January 1, 2001. It has expense ratio fee of 1.35% per year. You can buy the mutual fund from brokerage with $2,500 initial funding. The current share price is $29.49 (1/14/2013). Morningstar has ranked it with 3 stars rating. It has returned 30.77% over the past 1 year, 10.31% over the past 5 year, and 11.04% over the past decade. The 3 year beta risk is 1.46. If you invest $10,000 in this mutual fund 10 years ago, your capital would have grown to be $28,506. The top 3 sectors are financial services, consumer cyclical, and industrials. The top 2 stocks are Valassis Communications Inc, and Cobalt International Energy Inc.
Oceanstone Fund is one of the best mid cap value mutual funds. For 2012, it managed to have a year-to-date return of 22.35%. It invests majority of assets in common stocks on the New York Stock Exchange, American Stock Exchange, and NASDAQ. James J. Wang is the fund manager since 2006. Its total assets are $30 million. You can buy this domestic stock fund with $2,000 initial fund. Its expense fee is high, 1.80%. Ranked with 5 stars rating, this mid cap value mutual fund has returned 14.72% over the past 3 year, and 41.59% over the past 5 year. There is no sales load. The top 3 stocks are OfficeMax Inc, American Greeting Corporation, and General Motors Co. The Putnam Equity Spectrum Fund uses its assets to buy equity securities of leveraged small and midsize U.S. companies, including both growth and value stocks. David Glancy is the fund manager since 2009. Its dividend yield is 0.16%. It also has $743 million of assets. The expense ratio is 1.53%. This mid cap value fund has returned 24.29% in 2012. Morningstar has ranked it with 5 stars rating. As of October 2012, the top 3 sectors are healthcare, industrials, and communication services. The top 3 stocks are DISH Network Corp, EchoStar Corp, and L-3 Communications Holdings Inc.
Hartford Mid Cap Value Fund focuses its assets on undervalued mid-capitalization companies. It has 0.37% yield. The total assets are $340 million. The minimum initial investment is $2,000 for brokerage account. The expense ratio is 1.33% per year. The annual holding turnover rate is 54%. 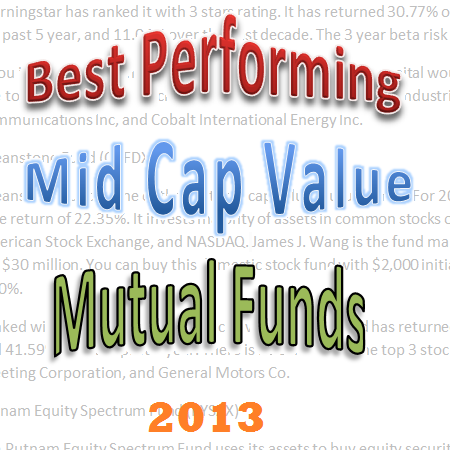 In 2012, this top performer mutual fund has an YTD return of 24.14%. Fidelity Value Fund is the top performing mid cap value mutual fund with 1.32% yield. This no load fund has total assets of $6.4 billion. The annual expense ratio is 0.68%. The fund’s shares price is $79.06. It invests in common stocks of undervalued companies. You can buy this mutual fund with $2,500 initial investment. Based on load adjusted returns, it has returned 12.43% over the past 3 year and 8.18% over the past decade. The best 1 year total returned was achieved in 2009 with 44.08%. The top 3 stocks are Sempra Energy, Berkshire Hathaway Inc, and Edison International.